MM Land: The happiest place on earth? 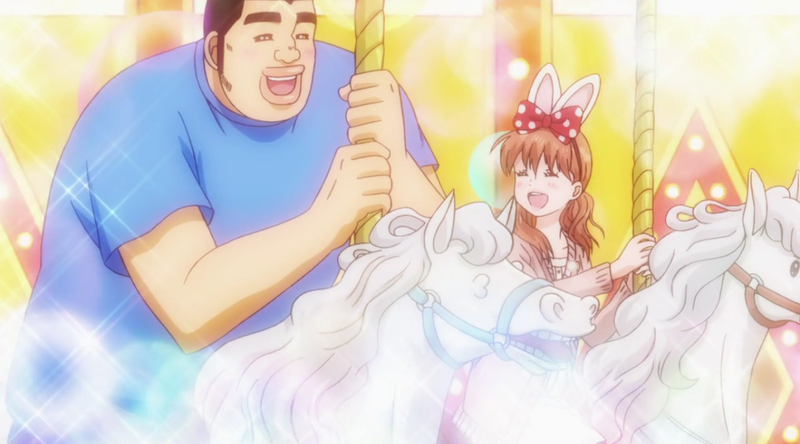 There’s an undercurrent of sadness throughout this episode, and I think a lot of it comes from the wistful understanding that Takeo and Yamato are living in a kind of glowy fantasy world themselves, and reality is constantly trying to find a way to burst their happy bubble. This week, “reality” takes the form of Oda, who intentionally separates them under the guise of helping Ai find closure. Their park date doesn’t go quite according to plan, although both are mostly pretty chill about it (they miss each other, but they’re not so codependent that they can’t handle spending a couple hours apart)—at least until it’s time for the Sparkly Parade, and the reality of their separation sets in with frantic urgency. This is literally how the world looks to Takeo at this point. Just golden sparkles and bubbles as far as the eye can see. Then it’s Ai to the rescue, first encouraging Takeo to run after Yamato on his own and then doing the same for Yamato (and easing her jinx fears along the way). 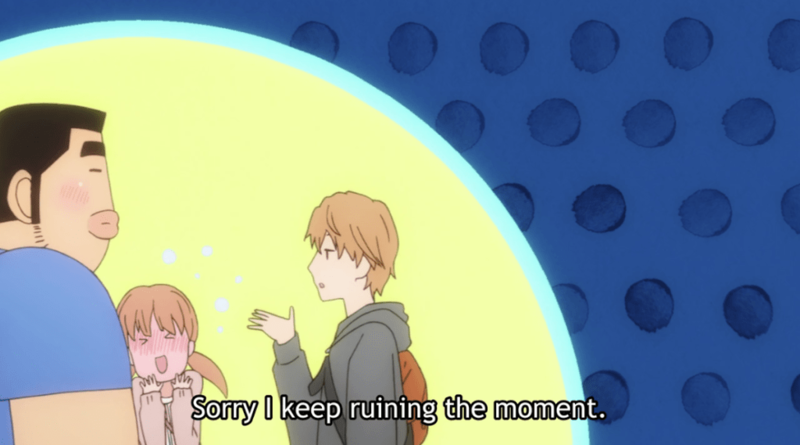 Ai’s choices this week were a little surprising, given how much OreMono encourages its characters to speak their minds, but it’s less an inconsistency and more an understanding of the nuanced nature of personal priorities. 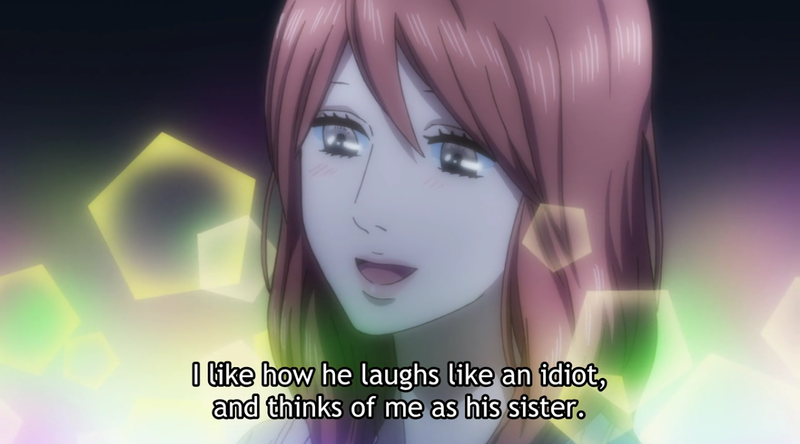 It’s not that Ai doesn’t want to tell Takeo, but when she balanced that desire against Takeo’s current happiness and her “big sister” relationship with both him and Yamato, she realized the latter was more important to her. Closure comes more from internal than external actions, after all, and the important thing for Ai is that she made this decision based on what she wanted, not out of fear. 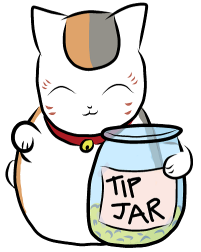 By the end of the episode, it’s easy to believe her when she says this is “enough” for her. As for the final point in this love quadrangle… well, Oda’s pretty much intentionally set himself up as the bad guy here, and seems to realize it from time to time, particularly when he sees Yamato so obviously wishing she could be riding the ducks with Takeo. I didn’t mind his initial scheme (giving Ai some time alone with Takeo so that, if she wants to confess, she can), but the fact that he kept it going for as long as he did suggested he was doing this more for himself—so he could find closure—than he was for Ai. If you listen very closely, you can hear Oda Trollololing to himself for 15 solid minutes this week. 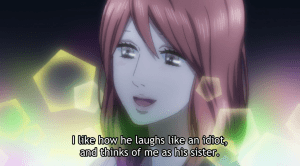 Still, he’s much more layered than your typical Pushy Rival Character, as demonstrated by his calm assertion that he’d “just cry a little” if Ai and Takeo ended up together. If Takeo and Yamato are living a half-step removed from “reality,” then Oda is on the opposite end of the spectrum, fully committed to the very real, painful outcomes that could come out of his schemes. That doesn’t make him right, but it does make him interesting, and a perfect foil to the Sunakawa siblings, both of whom are more “realists” (cynicists?) 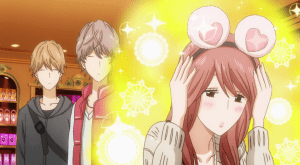 than optimists but feel no need to force others to see the world that way—and in fact often go to great lengths to help Takeo and Yamato maintain their sparkly shoujo bliss. I think what really saved Oda’s character for me, though, was when he realized what the confession might do to Ai herself. When he takes off on his own to find her, my first thought was that he’d changed his mind and didn’t want her to confess after all (afraid that Takeo might return her feelings). On second viewing, though, I think Oda was worried about Ai—that she’d confessed, been shot down, and was now sitting alone in the park somewhere—and wanted to find her so she wouldn’t be alone. It took him a while to realize the repercussions of his pushiness, but in the end I do think he was trying to do the right thing in his own, clumsy way, and it was good for Ai that he found her when he did. That sound you’re hearing is my heart growing 12 sizes and crushing my rib cage. TOTALLY WORTH IT. 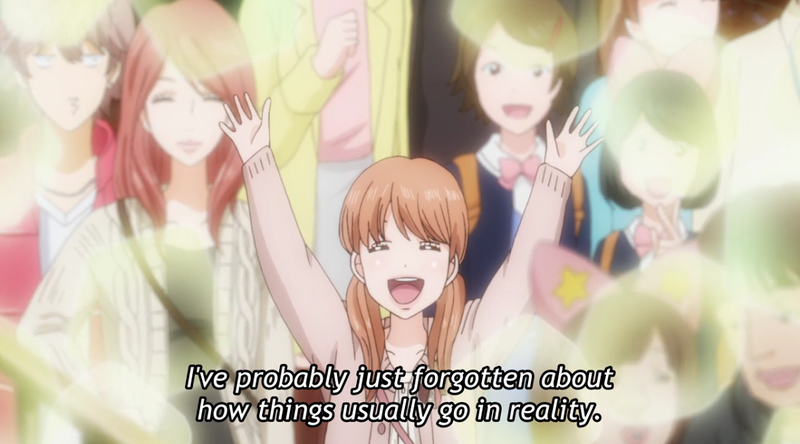 There’s a final point here about “finding” the important things, demonstrated both in Oda tracking down Ai and then in Takeo and Yamato spotting each other through the sea of people. It was a surprisingly moving moment, because as trivial as it may seem from a distance, OreMono beautifully captures in motion, color, and sound the feeling of badly wanting to be with someone, the fear of thinking it won’t happen, and then the sudden, relieved joy when it does. 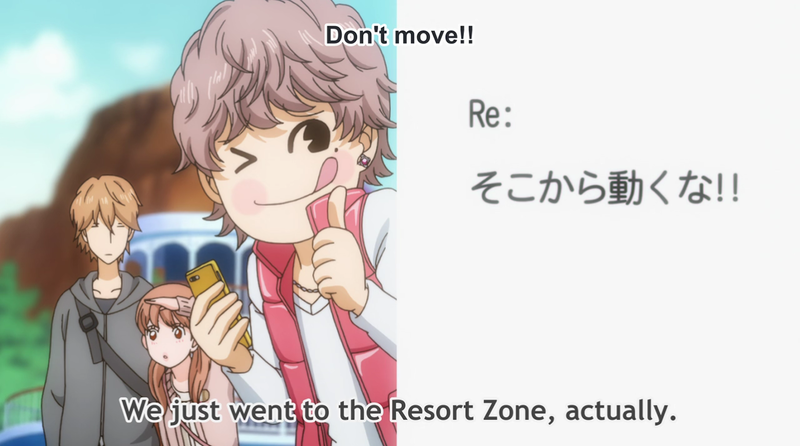 This series isn’t all shoujo sparkles and rainbows. It understands that relationships often don’t work out the way people want them to. There are misunderstandings, conflicts, separations both intentional and accidental. But it’s also a fiercely optimistic, even romantic series that genuinely believes in the powerful connections between people, and that those connections can be maintained if both parties work to make it happen. Maybe that means OreMono exists in the same fantasy bubble as Takeo and Yamato do, but much like the Sunakawa siblings, I’m happy it’s here, and in no hurry to see that bubble popped any time soon. I did this last week and it seemed to go over pretty well, plus sometimes there are random tidbits I like to share. So let’s just turn this into a weekly segment, shall we? Nishino Kana is a Japanese pop singer, and a quick scan on YouTube informs me that she writes a lot of fluffy love songs, but I’m not familiar enough with her to really get why it’s funny/awful that Ai keeps singing her at karaoke. Anyone with a greater knowledge of J-Pop is welcome to weigh in in the comments! 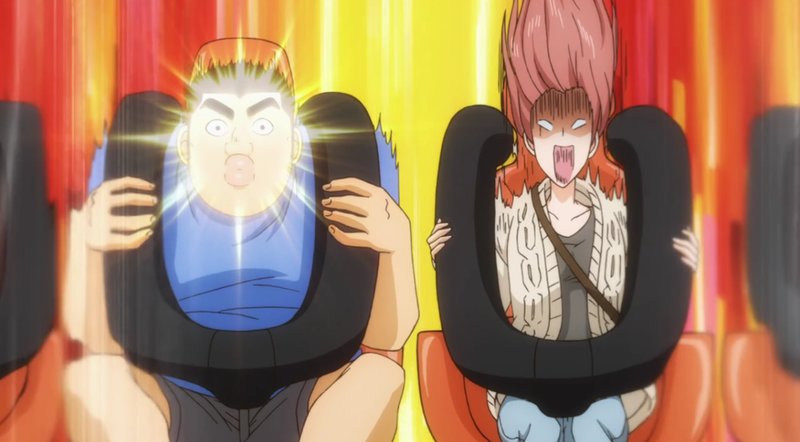 Takeo’s sudden screams on the haunted boat ride may have been the best executed comedic moment of the series, especially because they were juxtaposed with his and Suna’s rather grim relationship conversation. This wasn’t the funniest of episodes, but man, that scene was brilliantly done. 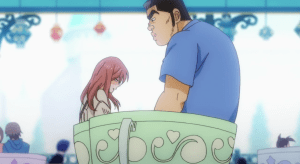 The CR subber opted to translate dokidoki as “nervous” this week instead of the “heart skip a beat” that they did during the beach episode, which is a shame, because Takeo admitting that Ai in her PJs made him dokidoki was almost certainly a callback to Yamato’s own dokidoki wishes from earlier. 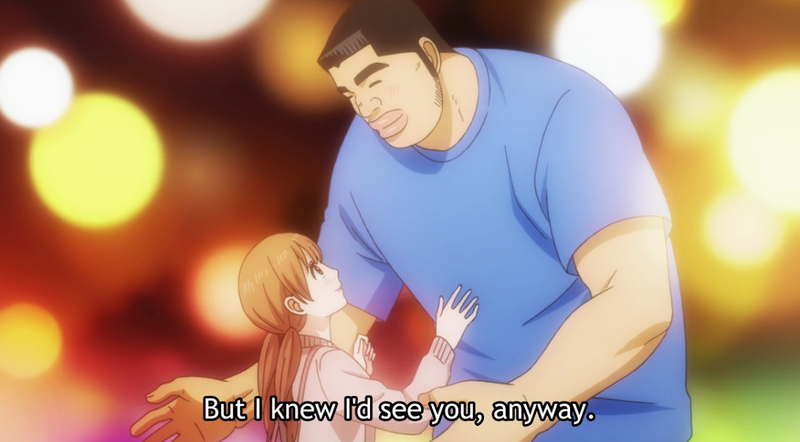 Not that I think the series is trying to set Ai up as a genuine rival for Takeo’s affections, but still, it’s a nice thematic connection and helps explain why Ai gets so a-flutter about it. Namikawa’s Oda imitating Eguchi’s Takeo was a thing of beauty.